Are you doing your part to help preserve the Earth by simple green living ways? When is the last time you have done the 4R’s, Reduce, Re-use, Recycle and Resale? While I’m in the hospital waiting for my CS procedure. I have the whole time thinking of my blogs and the ideas keep on coming in my head. It must be a mixture of anxiety or boredom perhaps. And on the side of the room, i noticed this picture of waste management disposal and told myself that this is a really nice idea to share to every one. 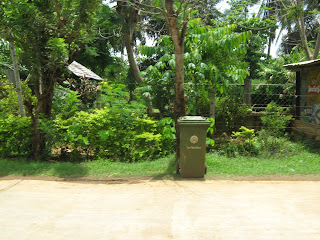 I think waste management is the common problems of every big cities and nations in the world. Every day, tons and tons of wastes are being dumped and if we don’t practice proper waste management by now, maybe by ten years , garbages will be filled more than half of the world and we won’t like that thing to happen. By doing the proper way of waste management, you can help the world -less clutter free , reduce the impacts of negative effects in our environment and save lots of money too. I always believe in the sayings that ” May pera sa basura” (There is money in the garbage). Some will think that a thing maybe considered a garbage but for others, this can be used or recycled into something far better. That is were green products and diy green living project comes to life or far better known as Reuse your refuse. Do you have something to share with us? Maybe a project perhaps. You can link them here and share it with our readers!